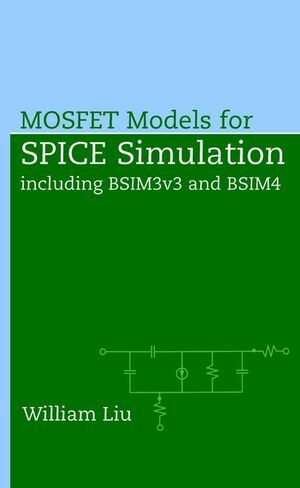 Used by more chip designers worldwide than any other comparable model, the Berkeley Short-Channel IGFET Model (BSIM) has, over the past few years, established itself as the de facto standard MOSFET SPICE model for circuit simulation and CMOS technology development. Yet, until now, there have been no independent expert guides or tutorials to supplement the various BSIM manuals currently available. Written by a noted expert in the field, this book fills that gap in the literature by providing a comprehensive guide to understanding and making optimal use of BSIM3 and BSIM4. WILLIAM LIU, PhD, is a senior member of the technical staff at Texas Instruments, where he has worked since obtaining his PhD in electrical engineering from Stanford University in 1991. Dr. Liu has been TI's lead contact in mentoring the development of BSIM4 model equations with UC Berkeley, and has been in charge of the modeling development for LDMOS/DEMOS and RF-CMOS in TI's SPICE Modeling Laboratory. Dr. Liu has authored/coauthored five book chapters, and has written more than fifty journal papers on modeling, device characterization, and fabrication. Dr. Liu has also published two books on III-V device technologies. Dr. Liu holds sixteen U.S. patents and is a senior member of IEEE. 1.1 SPICE Simulator and SPICE Model. 1.2 Numerical Iteration and Convergence. 1.3 Digital vs. Analog Models. 1.4 Smoothing Function and Single Equation. 1.7 Terminal Charges and Charge Partition. 1.9 Non-Quasi-Static and Quasi-Static y-Parameters. 1.10 Source-Referencing and Inverse Modeling. 1.11 Physical Model and Table-Lookup Model. 1.12 Scalable Model and Device Binning. 2 Basic Facts About BSIM3. 2.1 What Is and What's Not Implemented in BSIM3. 2.2 DC Equivalent Circuit Model. 2.7 Special Operating Conditions: VDS <&lt;/i>0, VBS > 0, VGS <&lt;/i>0, or VBD > 0>. 3.1 List of Parameters According to Function. 3.2 Alphabetical Glossary of BSIM3 Parameters. 3.3 Flow Diagram of SPICE Simulation. 4 Improvable Areas of BSIM3. 4.1 Lack of Robust Non-Quasi-Static Models: Transient Analysis. 4.2 Problem with the 40/60 Partition: The "Killer NOR Gate". 4.3 Lack of Channel Resistance (NQS Effect; Small-Signal Analysis). 4.4 Incorrect Transconductance Dependency on Frequency. 4.5 Lack of Gate Resistance (and Associated Noise). 4.6 Lack of Substrate Distributed Resistance (and Associated Noise). 4.7 Incorrect Source/Drain Asymmetry at VDS = 0. 4.9 Capacitances with Wrong Signs. 4.10 Cgg Fit and Other Capacitance Issues. 4.11 Insufficient Noise Modeling (No Excess Short-Channel Thermal Noise). 4.12 Insufficient Noise Modeling (No Channel-Induced Gate Noise). 4.13 Incorrect Noise Figure Behavior. 4.14 Inconsistent Input-Referred Noise Behavior. 4.16 Lack of GIDL (Gate-Induced Drain Leakage) Current. 4.19 Problems Associated with a Nonzero RDSW. 5.2 Physical and Electrical Oxide Thicknesses. 5.3 Strong Inversion Potential for Vertical Nonuniform Doping Profile. 5.5 VGST^ in Moderate Inversion. 5.10 GIDL (Gate-Induced Drain Leakage) Current. B Capacitances and Charges for All Bias Conditions.